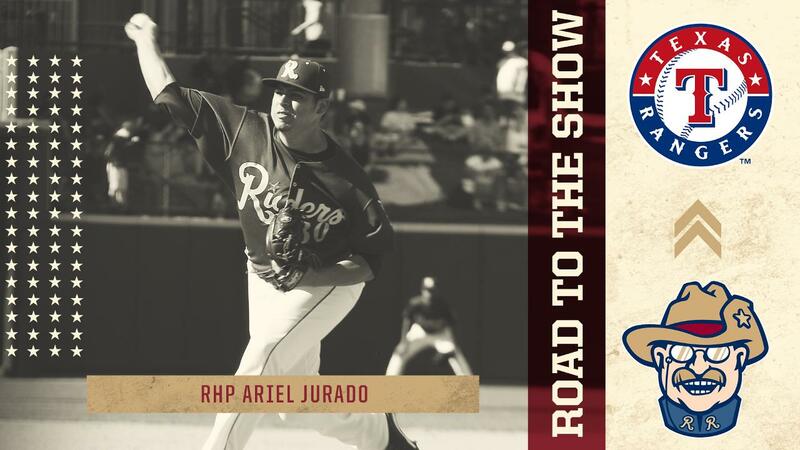 FRISCO, Texas (May 19, 2018) - Frisco RoughRiders right-handed pitcher Ariel Jurado has been promoted directly to the Texas Rangers and is scheduled to make his Major League debut in a start against the Chicago White Sox tonight at 6:10 p.m.
Jurado, 22, is off to a great start in 2018 with the RoughRiders, the Double-A affiliate of the Rangers. The Panamanian righty is 1-1 with a 2.57 ERA through his first six starts. He is in his third season with the Riders, which includes a selection to the Texas League Midseason All-Star team last year. Once he debuts, Jurado will become the 143rd former Riders player to make his Major League debut and the third this season, joining infielders Isiah Kiner-Falefa and Ronald Guzman . The Riders continue their four-game homestand tonight at 7:05 vs. Corpus Christi as they celebrate Military Appreciation Night, presented by ABC Home & Commercial Services. For tickets to tonight's game and other remaining home games during the Riders 15th Anniversary Season, visit RidersBaseball.com, call (972) 731-9200 or visit the Dr Pepper Ballpark box office.